While the government suffered a heavy defeat in the Oireachtas Inquiries referendum, the other referendum held the same day on judges' remuneration went in quite the opposite direction. 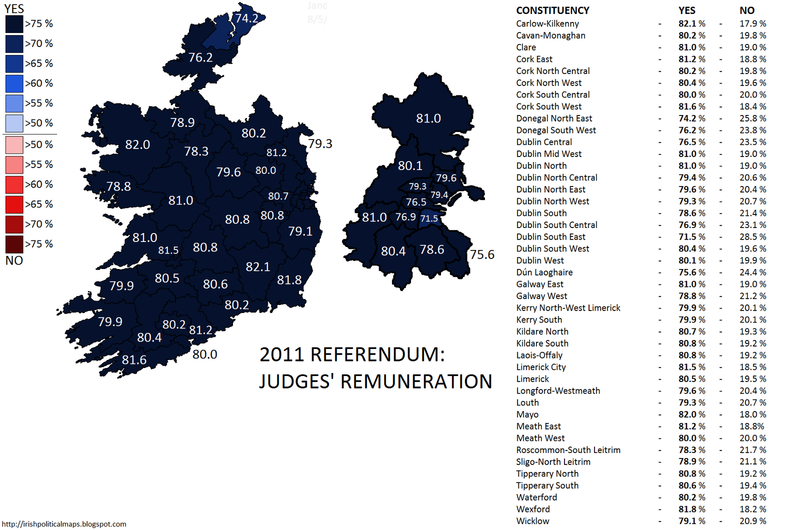 The reasoning behind the referendum was simple: with the economy in recession, the state simply could not afford to maintain the level of pay awarded to judges. Because the 1937 Constitution prevents the government from interfering in judges' pay in the name of judicial independence, the most that could be done to lessen this problem was to ask judges to take a voluntary pay cut. The Fianna Fáil/Green government led by Brian Cowen did so in 2008 on the advice of his Attorney General, Paul Gallagher. 125 of the state's then 147 judges agreed to the pay cut. A year later, Fine Gael TD Alan Shatter introduced a private members' bill seeking to change to Constitution to allow governments to adjust judicial pay. No action was taken on his proposal until 2011 when the Fine Gael-Labour coalition replaced Fianna Fáil in government. Shatter, now Minister for Justice, re-introduced the bill. It was approved by both Houses, pending a referendum on 27 October. Due to the economic context, the proposal was met with widespread public support, compared uncertainty voiced by many people on the Oireachtas inquiry. Members of the legal profession opposed the proposal on the grounds that it threatened judicial independence. Nonetheless public support did not waver as far as polling day, as the results show. The referendum was passed by a huge margin in every constituency. It's lowest margin of victory was in Donegal North East, where a still impressive 74.2% was won. The strongest vote for the proposal was in Carlow-Kilkenny, where it passed with 82.1% of the vote. The bill was duly declared passed, marking it as the only victory for Fine Gael in a day which saw it lose the presidential and Dublin West by-elections and the inquiries referendum.